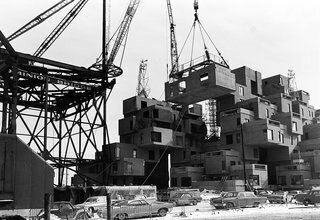 The architect reflects on Habitat ’67 and shares his thoughts on the future of prefabrication. 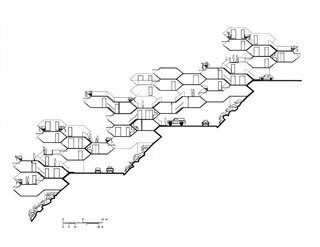 You were in your early twenties when you designed Habitat ’67. If you were to do it again today, would you still choose concrete? 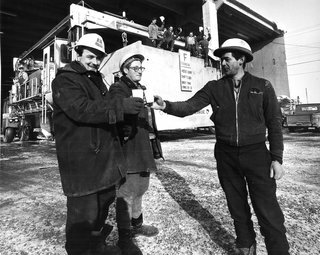 Builders toast the casting completion of the last box at Habitat ’67 in Montreal, Quebec. Safdie: I don’t think there has been any real breakthrough in primary building material since then. In the sense that there aren’t life-strong materials fireproof for high-rise construction other than steel and concrete. There are fiber carbons and all of that, but they’re not in the building range in terms of cost. So I might use concrete in a more sophisticated way, but I would certainly be using concrete. Construction took place from 1964 to 1967. The original project was adapted from Safdie’s graduate thesis at Montreal’s McGill University. Do you keep a residence there? How often do you get the opportunity to see other units? Safdie: There’s a lot of the original residents, believe it or not, and old friends, so I get to see the place. There’s been extraordinary transformation. People have redone the units; people have combined two, three into one. There’s been a great deal of inventiveness in how people have adapted the spaces. Habitat ’67 achieved Heritage status in 2009. Is there a common denominator among those interested in prefab? Safdie: Well, I think prefab is an issue unto itself, in the way that Habitat ’67 is really two ideas in one. One is about prefabrication, and the other is about rethinking apartment-building design in the new paradigm. I’m a believer in the technology of prefabrication and the efficiency it can bring, but it’s no guarantee of anything in terms of the quality of the environment. It depends on the design of the building. The 1960s were rampant with prefab buildings that were public housing projects of the worst kind. So I think it’s important to separate the two concepts. The architect continues to refine the Habitat concept. In your 1970 book, Beyond Habitat, you wrote that in order to create successful living environments we’re talking about, significant changes would have to occur in the realms of government, housing, and design. Have we made any progress? Safdie: I think we’ve done very little, in terms of the government acting as a catalyst. I mean government is kind of indifferent. Why don’t we say which government? I’m talking about the United States, but I think the industry is kind of waking up. What’s interesting to me is that developers, particularly in Asia, are opening up to the possibility of radically new designs. The projects we currently have in Singapore, China, and Sri Lanka, I couldn’t have dreamt of building that as middle-income housing ten years ago in the United States, or anywhere for that matter. 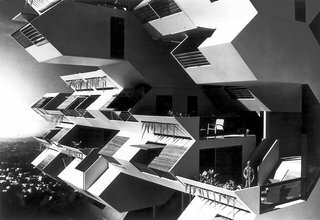 Do you think it would be difficult to build Habitat ’67 in today’s Montreal? Safdie: If I had to in the normal circumstances of the industry, it probably would be very difficult. Although I would get it done. I mean, I’m also a little older and wiser and have more experience. When you look back, you must be proud of your 23-year-old self. Safdie: When I look back, to be honest, it’s kind of a bit of a fairy tale that that 23-year-old got it done. You know, [I was] inexperienced, had never built a building. I think of people that age coming into my office today. It was kind of a little miracle, but I sort of smile and enjoy it and feel very good about the outcome. Safdie: I think prefab, as we understood it years ago, was naive, because I thought about prefabricated components, I mean parts of the entire home, and shipping them. I think transporting is a big obstacle and that prefab today is likely going in the direction of components of the house assembled. I think that that’s more like the car industry, which also transformed. It, today, makes parts all over the place and then assembles them. So it’s changing as we speak, prefab.